Developed for trench warfare. Initially, armament was to be placed in the front part of the hull and side sponsons. However, later it was decided not to add sponsons but to mount a turret. By 1943, when TOG 2* was completed and ready for trials, it was already obsolete. The vehicle never entered service. Monstrous hitpool exceeds tier VIII heavy tanks. Hull armor, at best, is acceptable, otherwise it is mediocre. The TOG II* is a long, strange tank. Almost as iconic to tankers as the Tiger I, this machine can soak up a lot of hits before going down, even exceeding some tier VIII heavies (IS-3). It is the slowest vehicle in the game, and is very long. It also has a good gun, similar to the Cromwell's and a thick turret. This makes it the best tank for a self-propelling wall that happens to be able to talk back, and one of the only ones. Smaller tanks (and there are plenty) can fire and duck back behind the TOG II*, while taller tanks like the T29 or even another TOG II* can go hull-down behind it. This tank's hitpoints may attract inexperienced players, but it will usually be too immobile to do too much, unless you slow other tanks down with your long hull. The TOG II* was built for trench warfare. While it was being built, they changed the main gun from sponsons to a turret. However, there was no trench warfare in World War II, so when it was completed in 1943, nobody cared about it anymore. 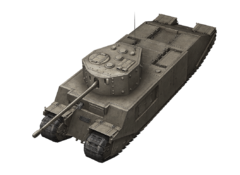 The TOG II* never entered service and became an antique relic. This page was last modified on 17 May 2017, at 16:05.